If you have fond recollections of 2015’s hit sci-fi picture “The Martian,” I reckon one of them might be of Matt Damon’s jubilant, never-say-die stranded astronaut vowing to survive on Mars and describing the challenge of it as “I’m gonna have to science the s**t out of this!” The new movie “Approaching the Unknown” is a sci-fi picture about getting to Mars, as opposed to being stranded there. The movie has a much less panoramic scale than the Ridley-Scott-directed big budget film, and marginally more sciencing-the-s**t-out-of-things action. It is well-intentioned, conscientious and competent in its filmmaking craft. 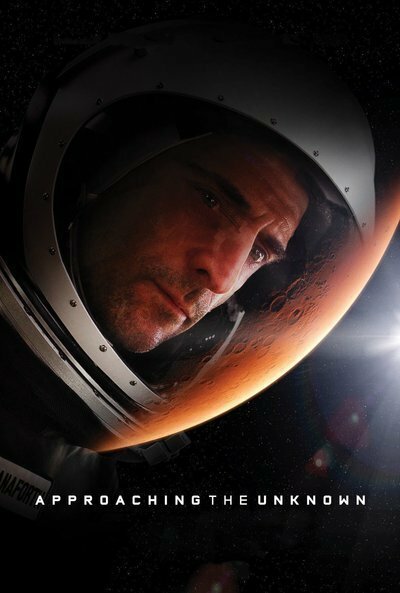 Mark Strong plays Captain William D. Stanaforth, who’s making a solo flight to Mars to begin colonization there. He knows he won’t be coming back to Earth, and he’s not too concerned about this. “Six billion people on Earth cheering me on are also wondering why I do this,” he muses in voiceover. Well, he does it because it’s what he does. Like all astronauts, he’s also an advanced scientist, one who’s figured out a way to make drinking water out of dirt, and whose spaceship is carrying a reactor that’s essential not just to his trip but to the job he’s going to do once he lands on the red planet. Following his craft is another spaceship, this one piloted by Sanaa Latham’s Capt. Maddox. She is, in the sparse video-screen views of her from Stanaforth's craft, considerably less chill than Strong’s character, and her temperament and the tech problems she faces provide the movie with some tense conflict early on. When not trouble-shooting for Maddox from afar, Stanaforth interacts with earthbound colleague and apparent best friend Louis Skinner, an ever-earnest Mission Control archetype played by Luke Wilson. “Approaching the Unknown” is the feature debut of writer/director Mark Elijah Rosenberg, and while it has the commercial misfortune of following on the heels of a Mars movie that was a much bigger deal, budget-wise, it is clearly influenced by the likes of classics such as “2001: A Space Odyssey” and cult items like “Silent Running"; you don’t get the impression of an opportunistic knockoff. Still, the movie’s observations about life in space cleave to a familiar track. There’s the fending off of loneliness by being spectacularly expert at one’s job. There’s the drawing of a connection between space-age technology and good-old-fashioned analog know-how—at a crucial point in the mission, which of course goes wobbly in all sorts of ultra-challenging ways as it progresses, Stanaforth takes out a cherished wooden tool box, an inheritance from an ancestor, and in there he finds just the right gadget to fix a problem with the reactor. Eventually things get worse than wobbly, and Stanaforth is faced with the possibility of aborting the mission. There’s only so much in the technical challenge department that he can survive. In the movie’s flashbacks, we see that Stanaforth's a man unencumbered by conventional family attachments, which makes him kind of a natural in the leaving-Earth-behind-for-good department. On the other hand, his forced-stoic disposition—which is portrayed very well by Strong, who’s made a pretty solid career out of playing roles in this mode—gives him a tunnel vision that’s a little disquieting. Faced with the notion of never landing on Mars, Stanaforth muses, “I wanna be ripped apart by space.” At this point in the movie, the visual allusions to “2001: A Space Odyssey” become ever more definite. But “Approaching the Unknown” ultimately avoids the “ultimate trip” turn that Kubrick’s visionary film took. It remains cool, competent, engaging within a narrow realm … but its unknown realm never explodes into anything remarkable.